BELIZE CITY, Mon. July 11, 2016–Eugene “Fatback” Webster, 50, reportedly is in a coma following a near-fatal knife attack by his stepson last Wednesday. He was stabbed many times in the neck, back and arm. 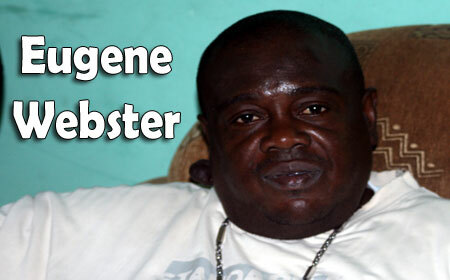 Webster was listed at the Karl Heusner Memorial Hospital (KHMH) in a stable condition after police found him lying in his blood at his Los Lagos home. When police went to his home on the morning of the incident, “Fatback” was still talking and was able to tell police what had transpired. Police reports had revealed that four knives were used in the stabbing after an early morning argument took place between Webster and his stepson. In a press conference last week, ACP Broaster had told Amandala, “Investigation reveals that he was stabbed by his stepson and we are currently looking for his stepson. The scene was processed and we observed that there were four knives used in the stabbing. Mr. Webster was talking; I must mention that at the time the police arrived, he explained to the officers that it was his stepson that caused the wounds to him. Fatback’s knife-wielding stepson did not reside at their home, but had just been visiting. Webster’s wife, Mrs. Caret Webster, told us that the young man was a regular visitor who left their home whenever he had enough food to eat. It was surprising, she told Amandala, that the young man, who was usually smiling, would do something of this nature. She told us that following the stabbing, her husband had gone into surgery at around 4 p.m. on Wednesday, the day he was stabbed. However, at around 9 p.m. that same night, after surgery at the KHMH, he fell into a coma. He had lost a lot of blood after he was stabbed, she said. She told Amandala that she is desperately hoping that her husband fully recovers. Fatback’s unidentified stepson, 21, remains a wanted man.